With the news that former Canadian Elite Road race Champion, Christian Meier has extended his contract with GreenEdge for another two years we thought it would be a good time to catch up with the 28 year-old from Sussex in New Brunswick. Meier first started to get noticed in 2005 when he won national titles in the U23 cyclo-cross and individual time trial in the colours of Canadian team Symmetrics. He was with them for 2006 and 2007, taking silver both years in the U23 TT and winning the U23 road race in 2007. In 2008 he took the elite road race title, a ride which caught the eye of Garmin – and Meier finished the year as a stagiare on the squad. He rode a heavy programme for a neo-pro in 2009 with participations in the Tour Down Under, Tour of Langkawi, Dauphine, Tour of Poland and Vuelta. The work rate continued the following season – Tour Down Under, Tour of Catalunya, Paris-Nice, Dauphine and Tour of Poland again where he played a major part in Dan Martin’s win. Individually he took seventh in the Tour of Britain on GC and 10th in the Giro del Veneto. Despite his solid season, there was no renewal and in 2011 he wore the UnitedHealthcare colours. Whilst the team was not on the World Tour, their programme was good – San Luis, Coppi e Bartali, California and Brixia were all on the list with Meier enjoying good form in the late season Italian semi-classics. 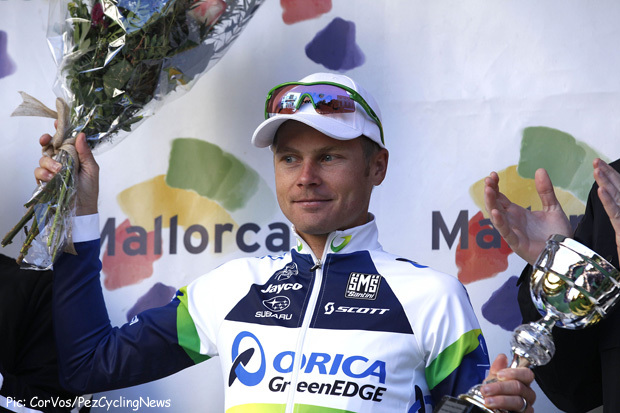 The hard work continued with new squad Orica-GreenEDGE through 2012 – Catalunya, Pais Vasco, Romandie and the Giro all rolled below his wheels. He also scored two notable home results – second in the Canadian individual time trial championship and third in the tough Tour de Beauce. 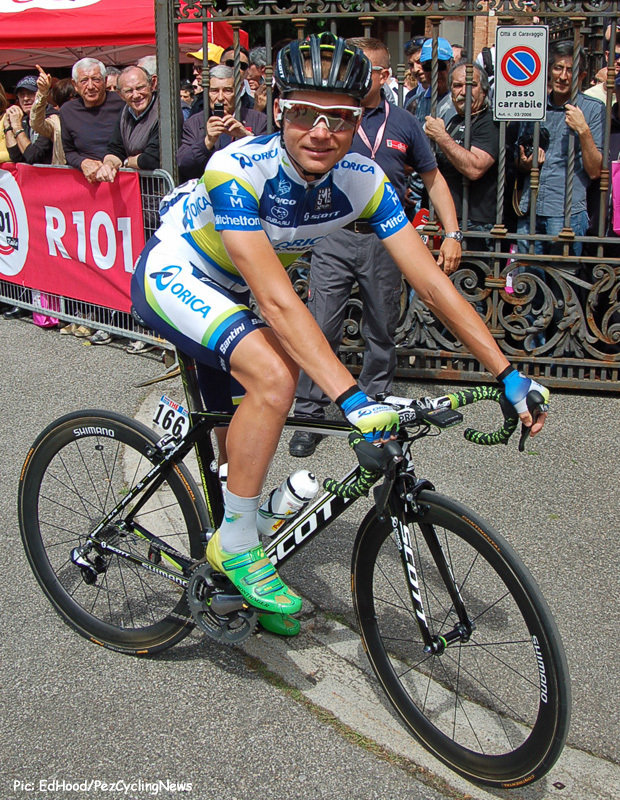 At the Giro in 2012 with GreenEdge. This season saw him ride ‘The Pink Race’ again, win the sprints competition in the Tour of Catalonia and again finish third in the Tour de Beauce. Here’s what he had to say to us recently from the Vuelta a Burgos – but just don’t look for him in any of those GreenEdge music vids! PEZ: 'Mr. Dependability' the team called you in the press release announcing the contract extension - that's pretty flattering. Yes it is - but I just love to race and train. PEZ: A two year extension must give peace of mind? In this industry as we well know things can change very quickly with teams coming and going, having good and bad years, it quite cut throat in a sense. Having two years gives you a bit more comfort which is always a great thing; you can just get on with doing your job without having to stress about the following year. PEZ: What are the 'nuts and bolts' of extending' - do you sit down with management and your agent? My managers take care of all of that. Management told me they would like to keep me around and from there the agents take care of everything else, I just signed the contract at the end of it all. Having good managers also makes things so much less stressful, they sort everything out. PEZ: Are you still in Girona - what's it like as a base and place to live? For us Girona is now much more of a home than just a base. My wife and I only return to Canada for a very short period maybe once a year. We really enjoy Girona, it has everything we need, super training and very nice people. PEZ: Who do you train with? I tend to train quite a bit by myself, but when I do go with others it can range drastically. There are so many riders in town you can usually find a small group to head out with. 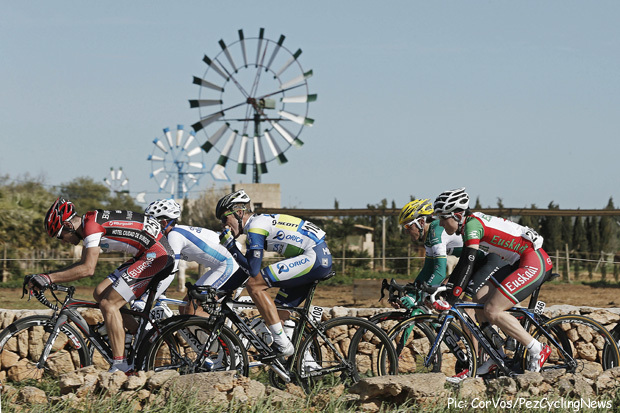 In the break in Stage 2 at the Volta a Catalunya, a ride that set up Christian's Sprint Jersey win. 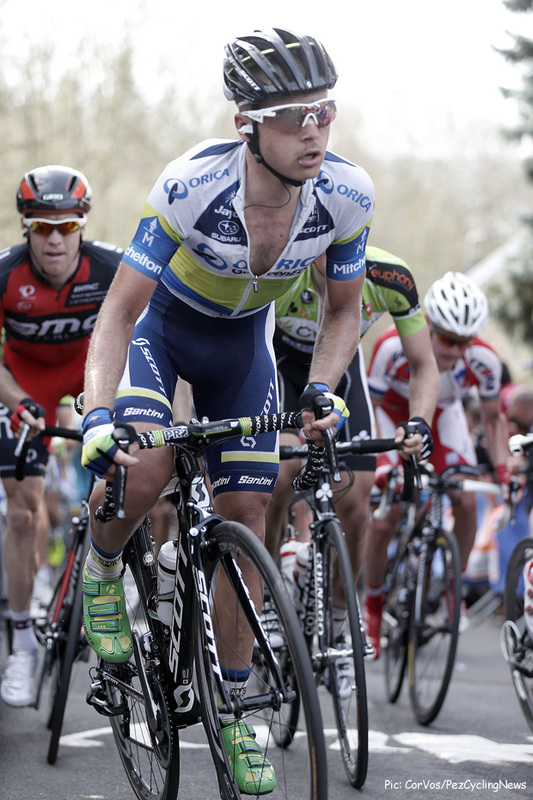 PEZ: GreenEdge - how does the Aussie attitude and culture compare to how things were at Garmin? I tend to think Aussie and Canadian personalities are quite alike, so I get on very well with their style of humour. Sometimes Americans don't have that same sense of humour. PEZ: Have you become an AC/DC fan and do you have an inflatable guitar? Music has actually never been a huge interest of mine. My iPod is full of songs my wife has uploaded for me - I do not own an inflatable guitar for the moment. PEZ: What's been the high spot of 2013 for you, so far? There have been plenty; one that really stands out for me is Gerro (2013 Tour de France stage winner and yellow jersey, Simon Gerrans) leading me out for an intermediate sprint at Catalunya. I had the sprints jersey and here was one of the best riders in the world helping me, it really showed the culture in the team. On the podium at the Volta a Catalunya. PEZ: You being from Canada, you must have enjoyed that snow on the Tre Cime in the Giro? PEZ: How many riders have Canada qualified for the Florence Worlds - do you hope to be there? I am not sure yet but I am maybe thinking three riders; I do really hope to be there. PEZ: The GreenEdge Worlds TTT will be a tough cut to make . . .
Yup, I’m staying well clear of that group! Christian smiling for the PEZ cameras at the start of Stage 17 of this year's Giro. PEZ: Are the 2014 Commonwealth Games in Glasgow a target? I’ve never done the Commonwealth Games and would love to give it a go; I’ve heard they are very cool. 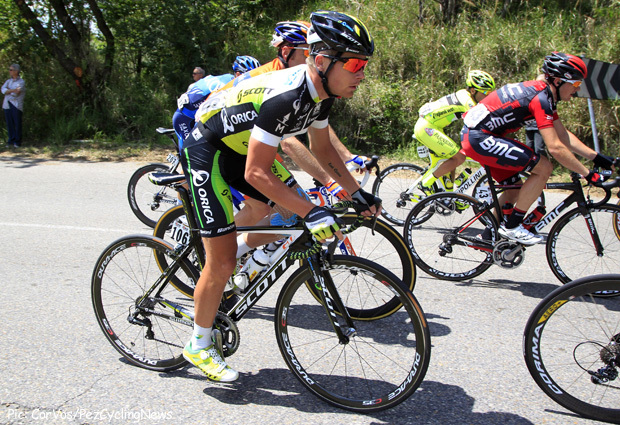 PEZ: Is the Tour de France still the big goal for 2014/15 - what else is on the 'to do' list? I do hope to get to the Tour in the next few years; I want to be there at least once in my career. A couple races I would still love to do are Milan-Sanremo and maybe the Tour of Oman as I have never been to that part of the world. PEZ: You've been racing at the highest level for almost a decade now - what are the biggest changes you've seen in the sport? Skinsuits! If you had you told Italian teams five years ago they would be wearing a skinsuit in a road race they would have laughed in your face. Christian in his skinsuit at Fleche Wallone earlier this year. Personally I quite like it, means I get to travel to cool new places! PEZ: The French Senate report - in your opinion should the lists of names have been revealed? Nope, I personally don't feel it accomplished much. PEZ: Being a World Tour professional - is it all it's cracked up to be? I would say so but like with all jobs there are some days that are harder than others.